Is It Legal to Bury Your Pet in Your Backyard? Most people are familiar with the time-honored "funeral flush" used to dispose of a child's dead goldfish via the toilet, but what laws govern the removal or disposal of larger pets? This article explores the legal realities you should consider following the death of your beloved dog, cat, bird, snake, gerbil, hamster or any other furry, finned or feathered non-human companion, and whether it's legal to bury a dead pet in your backyard or on some other property you legally own. The inexorable growth of human population over time, whether in existing or newly developed areas, inevitably results in the need for more rules and regulations governing the increasing complexity of the actions and social interactions of the people living in any given community. For example, while you or your parents might fondly recall shooting off fireworks in your front yard on July 4th, or trick-or-treating in the dark on Halloween night, many local communities now dictate if/when/how these activities may legally occur for various reasons. The same is true concerning the action of burying a dead pet in your backyard or on any property you legally own. For many reasons, including your personal safety, the well-being of others, environmental and other concerns, many local and/or state governments now regulate if/when/how you can bury the remains of your beloved pet in your backyard or on any property you legally own. In other words, do not assume that burying the body of your beloved pet in your backyard or on some other property you own is legal. The laws and regulations governing the removal or disposal of your pet, and whether it's legal to bury a dead pet in your backyard or some other property you legally own, can differ by state, county or municipality. Therefore, before attempting a pet burial on land you legally own, you should fully research and understand all laws pertaining to your property. The laws governing the disposal of dead animals in the state of Washington, for example, not only specify what constitutes a "dead animal" (fish and other primarily aquatic animals are not included), but also dictates how quickly the pet's owner, or the owner of the property on which the dead animal is found, must "properly dispose" of the corpse (within 72 hours). This Washington-state law also mandates not only the approved methods owners can use for a dead pet's/livestock's final bodily disposition (such as landfilling, incineration, composting, rendering, burial or some other approved form) but, in the case of burial, specifies how/where residents may legally bury their animals. Among other requirements, a minimum of 91.44 centimeters (3 feet) of soil, covering "every part" of the animal, is required, and the burial spot must be more than 30.48 meters (100 feet) "from any well, spring, stream or other surface waters." In Michigan, however, residents generally must dispose of dead pets/animals "not intended for human food" far more quickly (within 24 hours), but may legally bury animals at the less-backbreaking depth of (at least) 60.96 centimeters (2 feet) under the ground's "natural surface." Among other requirements, Michigan law also stipulates that residents must separate individual animal gravesites by a minimum of 76.2 centimeters (2.5 feet). The point of these examples is to illustrate the significant variance among the laws and regulations governing the burial of a dead pet or animal on private property these days. Again, before attempting a pet burial in your backyard or land you legally own, you should fully research and understand all laws pertaining to your property. If you've experienced the death of your beloved pet—whether that of your dog, cat, bird, snake, gerbil, hamster or any other furry, finned or feathered non-human companion—and wonder if you can legally bury it in your backyard or on some other property you legally own, the reality is that you might find it difficult to comply with the laws governing pet burial in your state, county or municipality. While nothing will likely prevent you at the time from burying your deceased pet on your private property, all it can take is one complaint from a neighbor to local authorities to trigger monetary fines and/or imprisonment for violating your local law, so you might want to consider other options, such as burial in a pet cemetery, cremating your pet, or creating a pet memorial on your property. "WAC 246-203-121 -- Disposal of dead animals." Washington State Legislature. "Michigan Department of Agriculture & Rural Development — Animal Industry." www.michigan.gov. "Dead Animal Disposal Laws in Missouri" by Charles D. Fulhage. University of Missouri Extension. How Deep Are the Dead Really Buried? What Will Happen to Your Digital Assets and Presence If You Die? Why Should You Buy a Cemetery Plot Before Dying? Can You Legally Create a Roadside Memorial Where a Loved One Died? 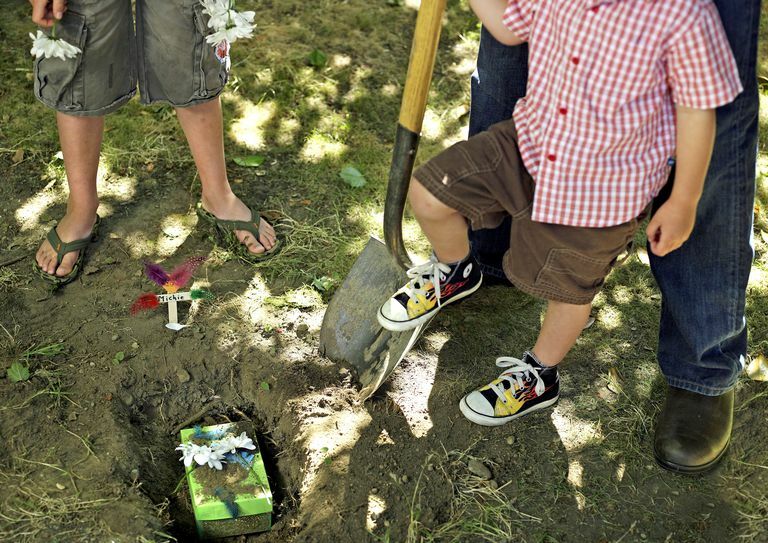 Should You Bring Your Child to a Funeral or Burial Service?